PARIS—After three years under a state of national emergency in France due to terrorism, it is no longer extraordinary to observe armed military patrols weaving among the hordes of fanny-packed, selfie-stick-wielding tourists below the Eiffel Tower. Similarly, an army squad with weapons drawn on the Renaissance-era Cours Mirabeau in the southern city of Aix-en-Provence on Wednesday hardly drew a single turned head from the scores of cafe revelers enjoying the shaded sidewalk terraces. On Monday on the Promenade des Anglais in Nice, where an Islamist militant killed 86 people with a truck on July 14, 2016, runners, cyclists, pedestrians, and street performers nonchalantly weaved around a fireteam of army soldiers who were clad in body armor and had their fingers resting on the trigger guards of their assault rifles. France has been under a nationwide state of emergency since the January 2015 terrorist attacks in Paris, in which Islamist militants killed 12 at the offices of the French satirical magazine Charlie Hebdo, and later killed four at a Jewish kosher market in east Paris. A succession of terrorist attacks across France in the intervening years have killed about 240 people and kept the emergency measures in place, ad infinitum. Consequently, the French people have adapted to living with the terror threat and the state’s protective measures against it as a part of life’s normal background din. So too are the French people adapting to their country’s upheaved political order, which is going on two weeks this Sunday. For 55 percent of French voters, their first choice for president won’t be on the ballot this Sunday during the second, final round of the French presidential election. It’s only the third time in the history of France’s Fifth Republic that the last two runoff contenders collectively garnered less than half of the first round vote. And for the first time in the history of the Fifth Republic, the two traditional poles of French political power—the Socialists and the conservative Les Républicains—have both been excluded from the second-round runoff. On May 7 French voters will choose between the two presidential candidates who emerged victorious from the first round vote on April 23—39-year-old centrist Emmanuel Macron, and 48-year-old Marine Le Pen from the far-right, eurosceptic, anti-immigration National Front party. It will be a historic choice between two candidates with diametrically opposing viewpoints about the policies needed to advance France out of its economic malaise, and solve the country’s myriad national security and social crises. In a move that has injected some last minute drama into the contest, Jean-Luc Mélenchon, a far-left candidate who took 20 percent of first round vote, said he won’t be voting for Le Pen and has refused to endorse Macron or say that he will vote for him, either. Mélenchon’s move has kept his voters out of Macron’s grasp, and opened a very narrow potential path to victory for Le Pen. According to a recent internal survey of Mélenchon’s political movement, “Unsubmissive France,” two-thirds of its members planned to either abstain from the second round of voting or cast a blank ballot. Going into the final weekend of his campaign, Macron, representing his upstart “En Marche” party, maintains about a 20 point polling advantage over Le Pen. According to the latest French polls released Thursday in the French newspaper Le Monde, 59 percent of voters support Macron, with 41 percent for Le Pen. Macron’s lead has remained relatively steady since he won the first round on April 23. The 39-year-old front runner’s greatest liability going into the second round, according to French news reports, is low voter turnout, which could, in theory at least, tip the scales in Le Pen’s favor. Thursday’s French papers were replete with bar graphs and pie diagrams explaining multiple scenarios in which Le Pen could conceivably mount a come-from-behind upset. Yet, apart from hypothesizing about how Le Pen could reverse the odds stacked against her, one fact remains crystal clear—both candidates are generally unpopular among French voters. Slightly less than half of the electorate, 47 percent, have a net unfavorable opinion of Macron, according to Thursday’s survey in Le Monde. While Le Pen was unpopular among 59 percent of those surveyed. According to the report, only 24 percent of French voters surveyed thought Macron had the “stuff” to be president. While for Le Pen, only 25 percent thought she possessed the same quality. The line of thinking among French journalists and political experts is that voters will rally in support of Macron to keep Le Pen out of office. But Macron does not appeal to a traditional voting bloc. Rather than galvanizing enthusiasm for his own candidacy to consolidate his winning majority, the former minister of economy is relying more on voters’ disillusionment with Le Pen and the National Front’s checkered history with racism and antisemitism—a tactic referred to in France as “diabolisation,” or demonization. Macron launched his party, En Marche, in April 2016 as a vehicle for his maverick presidential bid without the backing of a traditional party. Resultantly, Macron does not have an entrenched ideological base on which to lean as he consolidates his voting bloc. On the other hand, Le Pen’s supporters are passionate and steadfast, but they are a minority of the electorate and not sizable enough to carry the election outright. While nearly all polls point to a Macron win, there is a general sense of disappointment among French voters with the two choices facing them on May 7. 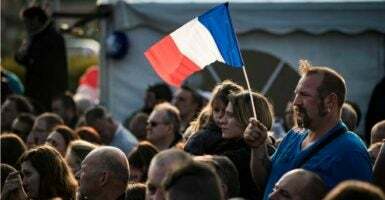 “I’m not really for one or the other, neither one is good for France,” Marc, a 60-year-old former French Marine who lives in Nice, told The Daily Signal. He asked that his last name not be published due to privacy concerns. Further damaging their reputations, Macron and Le Pen have increasingly turned to personal attacks in the final days of the campaign. Macron has cast the election as a moral choice, often alluding to the National Front’s troubled reputation due to a long history of controversial anti-semitic, racist, and Nazi-sympathizing remarks by its exiled patriarch Jean-Marie Le Pen. As recently as April, Marine Le Pen (daughter to Jean-Marie) made controversial comments denying France’s complicity in the Holocaust. Le Pen, for her part, at a May 1 rally in Villepinte slammed Macron for being indebted to France’s banking system. “The entire oligarchy that undermines me, but is also against you, with undignified arguments, wants to make you beholden to the banker Macron,” Le Pen added. Some French voters are more swayed by the candidates’ positions on key issues than they are by the mudslinging. Marron, the 20-year-old student from Nice, and Ferrer, the Aix-en-Provence taxi driver, were originally supporters of François Fillon, the conservative Les Républicains candidate who was ousted in the first round vote. Yet, for the second round of the election, both Marron and Ferrer are, in fact, voting more to oppose one particular candidate than to support another. Macron and Le Pen have both faced accusations of being indebted to shadow donors. A common line of attack against Macron is that he is controlled by bankers and pro-European Union financiers. While Le Pen’s National Front party received a €9 million loan in September 2014 from the First Czech-Russian Bank, which is linked to the Kremlin, raising questions about how deep her ties to Moscow run. For Marron, who supports Macron, the source of both candidates’ funding was not a top concern. In particular, she wasn’t worried by Le Pen’s financial ties to Moscow. Yet, others are disillusioned about the candidates due to their alleged financial ties. Ferrer, who supports Le Pen, said Macron’s alleged ties to the banking world are a disqualification. Today, as part of the ongoing emergency measures, French soldiers patrol the streets of major French cities and important landmarks. In Paris, they stand guard out front of the Notre Dame Cathedral, at the entrance to the Louvre, and at the foot of the Eiffel Tower. On Thursday, armed military patrols weaved through crowds gathered to enjoy a sunny spring day in the Tuileries Garden outside the Louvre. Evidence of the election, and its contentiousness, was mostly limited to graffiti and vandalized campaign posters. 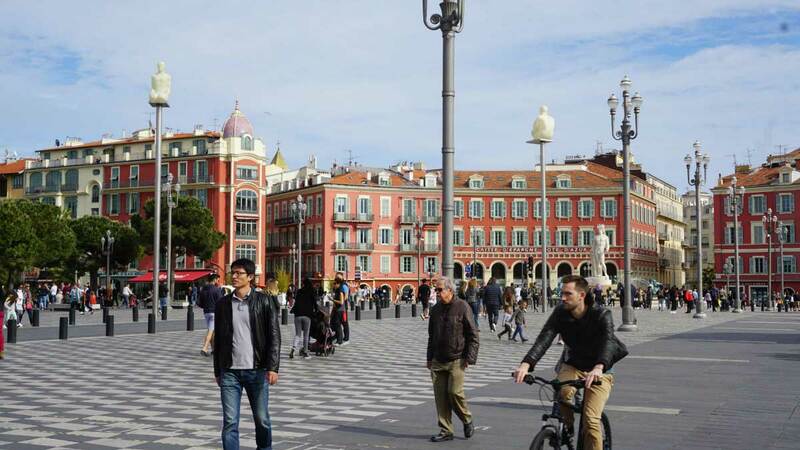 In Nice, it appears the city is back on its feet after last July’s deadly terror attack, in which an Islamist militant drove a truck onto the crowded Promenade des Anglais boardwalk during Bastille Day celebrations, killing 86. 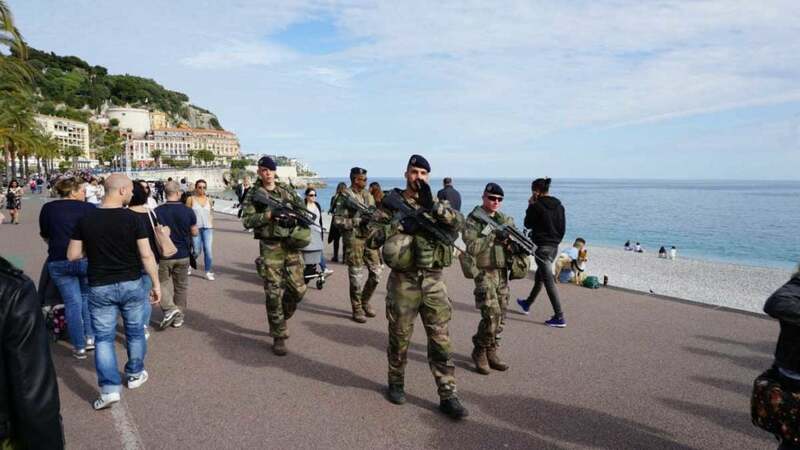 Today, the Promenade des Anglais is once again bustling with tourists. There is a near constant stream of joggers and bicyclists. Even on a cool spring afternoon with a steady sea breeze, swimmers are down on the rocky beach in their speedos. Street performers play guitar, paint portraits, and do roller-skating tricks to the applause of the passing crowds. Among the human traffic, one hears a symphony of voices, languages, and accents. English, German, Italian, Chinese, Russian, and Arabic. Clues to last summer’s terrorist attack are subtle. Armed military fireteams patrol along the boardwalk and through the city streets. They wave a finger disdainfully at this correspondent as he snaps a photo. 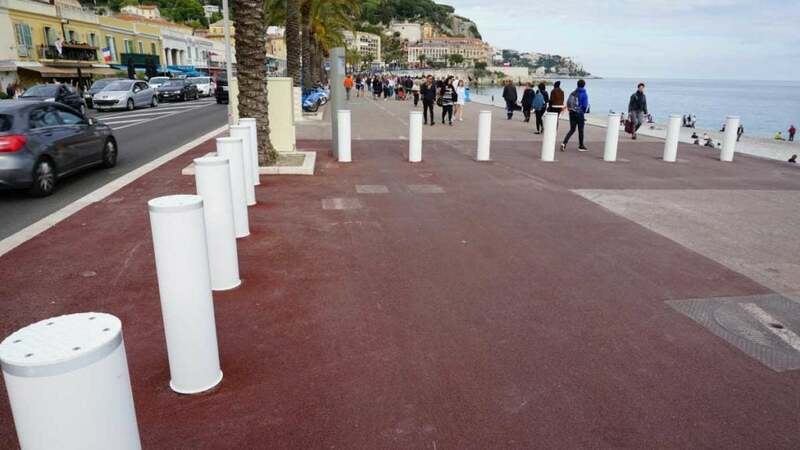 A line of freshly painted white metal barricades marks the edges and ends of the Promenade des Anglais—a defense against another vehicular attack. Yet, one can also get a sense of the latent animosity between the opposing camps of voters. 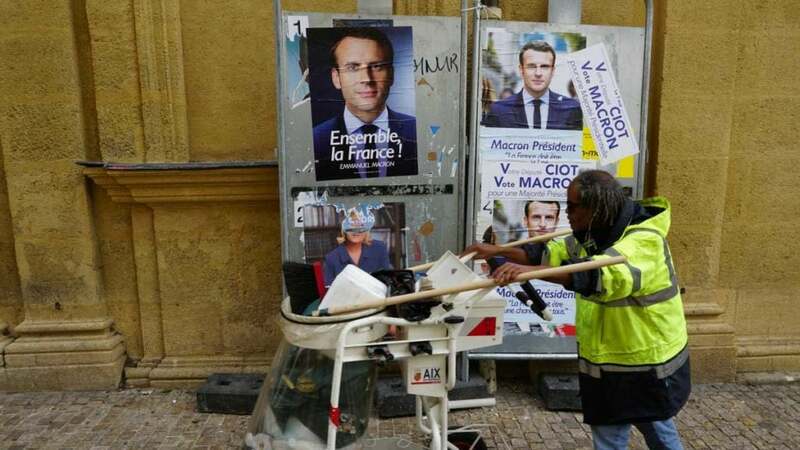 At an advertisement board along Rue de France in central Nice, campaign posters for both Macron and Le Pen have been vandalized, with the eyes of the candidates scratched out, or the faces covered in vulgar graffiti. The ebb and flow of the city’s tourism economy seems, outwardly, to be vibrant. Rue de France is lined with cafes and restaurants and is in places sealed off to vehicular traffic. On this May Day weekend one week before the election, tourists clog the streets and fill the outdoor terraces. Craftsman from North Africa lay out their wares for sale on exotic carpets. However, some area residents say times have been hard since the terror attack. Beneath the surface, one can also observe evidence of France’s latent social tensions, which sometimes boil over into violent protests, and, some experts claim, have left segments of France’s Muslim minority population, many of whom are second or third generation immigrants from North Africa and the Middle East, disaffected and vulnerable to Islamist radicalization. At the Atrium Cafe on Nice’s Rue de France, two customers got into a heated argument with a server for an unknown reason. Nearby pedestrians stopped, heads turned to see what was going on. But France’s social divides are about more than integrating different social or immigrant groups. There is also a burgeoning economic divide between the working middle class and what they perceive as the gilded, super wealthy elite living in Paris. Overall, the economy, and the fractured state of French society, were of greater concern to most French voters than terrorism. Whatever outcome occurs this Sunday, the election is sure to leave the country divided. A spider’s web of interwoven economic, social, and national security issues will, until they are resolved, likely drive bigger wedges between the myriad political camps in France who attribute those crises to vastly different variables.